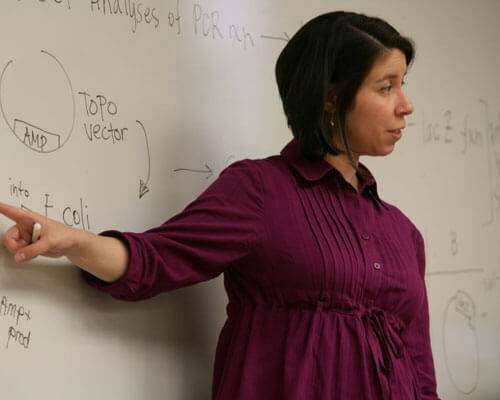 Home » Academics » Schools » School of Science, Engineering and Technology » Faculty » Verónica Contreras-Shannon, Ph.D.
Veronica Contreras-Shannon, Ph.D., earned her bachelor’s in Biology after which she participated in research at Los Alamos National Lab in Los Alamos, New Mexico. Later, she earned her doctorate from the Department of Biochemistry in the Graduate School of Biomedical Sciences. After completing her doctoral work in 2003, she completed two postdoctoral fellowships. While a graduate student at UTHSCSA, her research elucidated the role of three differentially compartmentalized isozymes of NADP+-dependent isocitrate dehydrogenase in yeast. These studies led to an understanding that these multiple isozymes participate in the shuttle of NADPH reducing equivalents among various cellular compartments and provided strong evidence for isozyme involvement at the intersection of both carbon and nitrogen metabolism. Her postdoctoral training addressed the molecular mechanisms associated with disease states. During Contreras-Shannon’s first fellowship, she examined how the regeneration of damaged muscle was influenced by inflammatory cells following injury. During her second fellowship, she studied the functional role of proteins encoded by genes that were found to be amplified in prostate cancer. She is trained in the Pathobiology of Occlusive Vascular Disease, Immunology, Muscle Regeneration, Genetics and Cancer Biology. Contreras-Shannon V, Heart D*, Catano G, Maffi S, Navaira E, and Walss-Bass C. Clozapine-induced mitochondria alterations and inflammation in brain and insulin-responsive cells. PLoS One 2013 Mar; 8(3):e59012. Winklmeier A, Contreras-Shannon V, Arndt S, Melle C, Bosserhoff A-K. Cadherin-7 interacts with melanoma inhibitory activity protein and negatively modulates melanoma cell migration. Cancer Sci 2009 Feb; 100(2):261-8. Shireman PK, Contreras-Shannon V, Ochoa O, Karia BP, Michalek JE, McManus LM. MCP-1 deficiency causes altered inflammation with impaired skeletal muscle regeneration. J Leukoc Biol 2007 Mar; 81(3):775-785. Contreras-Shannon V, Ochoa O, Reyes-Reyna SM, Sun D, Michalek JE, Kuziel WA, McManus LM, Shireman PK. Fat accumulation with altered inflammation and regeneration in skeletal muscle of CCR2-/- mice following ischemic injury. Am J Physiol Cell Physiol 2007 Feb; 292(2):c953-c967. Shireman PK, Contreras-Shannon V, Reyes-Reyna SM, Robinson SC, McManus LM. MCP-1 parallels inflammatory and regenerative responses in ischemic muscle. J Surg Res 2006 Jul; 134(1):145-157.